Its complexity begins with the difficulty in adopting terminology that can express its exact meaning. Moreover, many methods to evaluate compliance have. Parental Drug Use, Treatment Compliance ami Reunification: Client Classifications and the Common Wisdom in Child Welfare. Brenda D. Smith, Ph.D. Ph.D.
... falores socioeconomicos (residencia, meio de transporle. nivel educacional, condic;;ao ... Eisen SA, MillerDK, Woodward RS, Spitznagel E, PI-Lybeck. TR. May 5, 2011 - we suggest that diagnosis, prevention and treatment in this age group ... Introduction. Metabolic syndrome (MetS) is a complex disorder with ...... 138. Goodman E, Daniels SR, Meigs JB, Dolan LM: Instability in the diagnosis of. Patient compliance with inhaled medication: Does combining beta-agonists with corti- costeroids improve compliance? C.M. Bosley, D.T. Parry, G.M. Cochrane. Lopes N, Zanini AC, Casella-Filho A, Chagas ACP. Metabolic syndrome patient compliance with drug treatment. Clinics. 2008;63(5):573-80. OBJECTIVES: 1) To evaluate the compliance with drug treatment in patients with metabolic syndrome. 2) To determine association between access to and use of medicines, as well as the level of knowledge of cardiovascular risk factors and compliance. INTRODUCTION: Low compliance has been one of the greatest challenges for the successful treatment of chronic diseases. Although this issue has been widely studied in patients with isolated hypertension, diabetes and dyslipidemia, compliance studies involving patients with these concomitant diseases or with metabolic syndrome diagnosis are scarce. METHODS: This was a cross-sectional study involving patients who have been diagnosed with metabolic syndrome according to the IDF criteria. Patients were being treated in a Health-Medical School Center bound to the Public Brazilian Healthcare System. This study was conducted in two phases. Phase I was characterized by analyzing medical records and Phase II involved interviewing the patients. A variation of the Morisky-Green Test was used to evaluate compliance. Compliance was the dependent variable and the independent variables included access to medicines, the use of medicines and the level of knowledge concerning cardiovascular risk factors. RESULTS: Two hundred and forty-three patients were identified as being eligible for Phase II, and 75 were included in the study. The average level of compliance was 5.44 points (standard deviation of 0.68), on a scale ranging from 1.00 to 6.00 points. There was no statistically meaningful association between independent variables and compliance. The level of patient knowledge of diet and dyslipidemia was considered to be low. CONCLUSIONS: Patients involved in this study exhibited a high level of compliance with drug treatment. Further research is needed to better elucidate the compliance behavior of patients who have been diagnosed with metabolic syndrome. KEYWORDS: Adherence; Hypertension; Diabetes; Abdominal obesity; Drug utilization. Compliance with treatment of metabolic syndrome Lopes N et al. patient had died (0.41%). Of the 83 scheduled patients, 8 did not attend their appointment. As a result, 75 patients with confirmed metabolic syndrome diagnosis were included in this study. Table 2 presents the characteristics of the 243 identified patients. Social-demographic characteristics. Among the 75 included patients, 41 (54.66%) were women. Average Table 1 - Results of each step of medical record analysis and patient selection Step 1 – Electronic patients database analysis 550 records of diabetic and / or hypertensive patients Step 2 – Data collection from medical records 483 medical records available Step 3 – Selection of overweight or obese patients 56 medical records without information about obesity 60 patients with BMI* < 25 kg/m2 367 overweight or obese patients (BMI ≥ 25 kg/m2 or obesity diagnosis specified on medical notes) Step 4 – Data analysis of other metabolic syndrome components 200 patients with diagnosis of MS† (BMI ≥ 30 kg/m2 + 2 components) 144 patients with evidence of MS (132 with 25 ≤ BMI ≤ 29.9 kg/m2 and 12 with obesity diagnosis from medical notes + 2 components) In 23 cases it was not possible to suppose presence of MS with available data. Step 5 – Other inclusion and exclusion criteria checked 101 patients excluded (1 without drug treatment and 100 older than 70 years) 243 patients identified for Phase II * BMI = Body Mass Index. † MS = Metabolic Syndrome. SD: Standard deviation. Statistically significant: p < 0.05. * Body Mass Index based on weight and height measurements from medical records from the last physician evaluation; **Triglycerides and HDL-cholesterol values from medical records from the last laboratory blood tests; † Systolic and Diastolic Blood Pressure descriptive values from medical records from the last physician evaluation; ‡ Descriptive value of glycemic levels from medical records from the most recent laboratory blood tests. HT: Hypertension diagnosis based on medical notes and prescription of antihypertensive drugs; DM: diagnosis of diabetes mellitus based on medical notes and prescription of antidiabetic agents; Elevated TG: triglycerides ≥ 150 mg/dl according to medical records from the last laboratory blood tests; Reduced HDL: HDL-cholesterol ≤ 40 mg/dl (for men) and ≤ 50 mg/dl (for women) according to medical records from the last laboratory blood tests. SD: Standard deviation. BMI: Body Mass Index. NA: Not available. SD: Standard deviation. *∆T: Period of time, in months, between last medical records and at the time of patient inclusion in the study. **Systolic and Diastolic Blood Pressure values from medical records from the last physician evaluation. † Glycemic level value from medical records from the most recent laboratory blood tests. ‡ Triglyceride and HDL-cholesterol values from medical records from the last laboratory blood tests. improving compliance levels.27,31 In spite of this approach, its application on a daily basis demands continual effort, self-discipline and teamwork by health professionals.31 As these challenges are met, the multidisciplinary approach is considered to be part of the health system’s daily routine, and elevated compliance levels are possible. This study also identified a lack of knowledge of cardiovascular risk factors, mainly diet and dyslipidemia. Knowledge about disease or treatment does not guarantee patient compliance,34 but it is an important factor in active patient participation in decisions that involve his/her health condition.35 From this point of view, there may be an opportunity to promote cardiovascular risk reduction. The adoption of educational strategies that improve patient knowledge of cardiovascular risk factors may give them an incentive to actively participate in their treatment and to make treatment success more tangible. This may be the first step in effectively introducing diet and regular practice of physical activity in daily routines, once these activities are associated with significant clinical improvements.36 Finally, better knowledge of cardiovascular risk factors may lead to more rational utilization of financial resources. CONCLUSIONS Patients with metabolic syndrome who were being treated in a Health-Medical School Center with antihypertensive, antilipemic and antidiabetic agents, have demonstrated a high level of drug compliance. There were no statistically significant associations between access to and use of medicines and level of knowledge of cardiovascular risk factors and compliance. Patients included in this study also demonstrated a low knowledge of diet and dyslipidemia; this may have implications for non-drug treatment and for the reduction of cardiovascular risk. However, this hypothesis needs further investigation. More research is needed to confirm if the high level of compliance found in this study is characteristic of patients treated in a Health-Medical School Center in comparison with patients treated in other public or private healthcare centers. Additionally, it might be especially elucidative to have comparative studies enrolling patients with metabolic syndrome as well as other patient groups with diagnoses of isolated hypertension, diabetes and dyslipidemia. REFERENCES 1. Third report of the national cholesterol education program (NCEP) expert panel on the detection, evaluation, and treatment on high blood cholesterol in adults (Adult Treatment Panel III). Final report. II Rationale for intervention. Circulation. 2002;106:3188-90. 2. World Health Organization. Definitions, diagnosis and classification of diabetes mellitus and its complications. Report of a WHO Consultation. Part I: Diagnosis and classification of diabetes mellitus. Geneva: WHO, 1999. Compliance with treatment of metabolic syndrome Lopes N et al. 3. Ford ES, Giles WH, Mokdad AH. Increasing prevalence of the metabolic syndrome among U.S Adults. Diabetes Care 2004;27:2444-9. 4. Gupta R, Deedwania PC, Gupta A, Rastogi S, Panwar PB, Kothari C. Prevalence of metabolic syndrome in an Indian urban population. Int J Cardiol 2004;97:257-61. 5. Brandão AP, Brandão AA, Berenson GS, Fuster V. Síndrome metabólica em crianças e adolescentes. Arq Bras Cardiol 2005;854:79-81. 6. Lorenzo C, Williams K, Hunt KJ, Haffner SM. National Cholesterol Education Program – Adult Treatment Panel III, International Diabetes Federation, and WHO definitions of the metabolic syndrome as predictors of cardiovascular disease and diabetes. Diabetes Care 2007;30:8-13. 7. Bahia L, Aguiar LG, Villela N, Bottino D, Godoy-Matos AF, Geloneze B, et al. Relationship between adipokines, inflammation, and vascular reactivity in lean controls and obese subjects with metabolic syndrome. Clinics. 2006;61:433-40. 20. Delgado AB, Lima ML. Contributo para a validação concorrente de uma medidade de adesão aos tratamentos. Psicologia, Saúde & Doenças. 2001, 281-100. 21. I Diretriz Brasileira de diagnóstico e tratamento da síndrome metabólica. Hipertensão 2004;7:123-59. 22. Zimmet PZ, Alberti G. The metabolic syndrome: perhaps an etiologic mystery but far from a myth – Where does the international Diabetes Federation Stand? Medscape Diabetes & Endocrinology 2005;7 (2). [cited 2006 Oct 31]. Available from: http://www.medscape.com/ viewarticle/514211. 23. Kahn R, Buse J, Ferranini E, Stern M.The metabolic syndrome: time for critical appraisal. Joint statement from the American Diabetes Association and the European Association for the Study of Diabetes. Diabetologia 2005;48:1684-99. 24. Franks PW, Olsson T. Metabolic syndrome and early death: getting to the heart of the problem. Hypertension 2007;49:10-2. 8. Fujioka K. Metabolic syndrome treatment strategies. Pharmacotherapy 2006;26:222S-6S. 25. 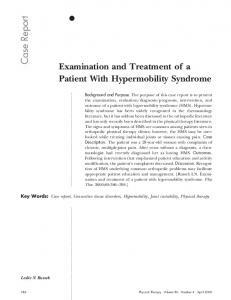 Kahn R. metabolic Syndrome: Is it a syndrome? Does it matter? Circulation 2007;115:1806-11. 9. 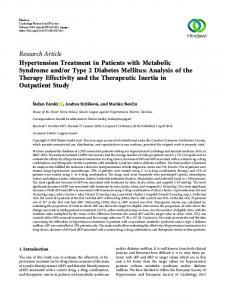 Israili ZH, Lyoussi B, Hernandez-Hernandez R, Veslasco M. Metabolic syndrome: treatment of hypertensive patients. Am J Therap 2007;14:386402. 26. 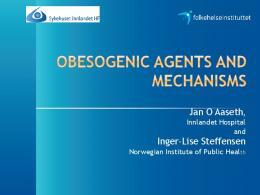 Tikhonoff V, Casiglia E. Metabolic syndrome: nothing more than a constellation? Eur Heart J 2007;28:780-81. 10. Grundy SM. Controversy in clinical endocrinology. Metabolic syndrome: a multiplex cardiovascular risk factor. 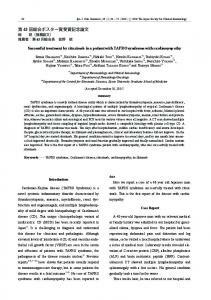 J Clin Endocrinol Metab 2007;92:399-404. 11. Luz PL, Bertini PJ, Favarato D. Noninvasive detection of coronary artery disease – challenges for prevention of disease and clinical events. Clinics 2005;60:415-28. 12. DiMatteo MR, Giordani PJ, Lepper HS, Groghan TW. Patient adherence and medical outcomes: a meta-analysis. Medical Care 2002;40:794811. 13. Schroeder K, Fahey T, Ebrahim S. How can we improve adherence to blood pressure–lowering medication in ambulatory care? Systematic review of randomized controlled trials. Arch Intern Med 2004;164:72232. 14. World Health Organization. Adherence to long-term therapies: evidence for action. Geneva: WHO, 2003. 15. Benner JS, Glyin RJ, Mogun H, Neuman PJ, Weinstein MC, Avorn J. Long-term persistence in use of statin therapy in elderly patients. JAMA 2002;288:455-61. 27. Osterberg L, Blaschke T. Adherence to medication. N Engl J Med 2005;353:487-97. 28. Morisky DE, Green LW, Levine DM. Concurrent and predictive validity of self-reported measure of medication adherence. Med Care 1986;24:67-74. 29. Third report of the national cholesterol education program (NCEP) expert panel on the detection, evaluation, and treatment on high blood cholesterol in adults (Adult Treatment Panel III). Final report. IX Adherence. Circulation. 2002;106:3359-66. 30. Krapek K, King K, Warren SS, George KG, Caputo DA, Mihelich K et al. Medication adherence and associated hemoglobin A1c in type 2 diabetes. Ann Pharmacother. 2004;38:1357-62. 31. V Diretrizes Brasileiras de Hipertensão Arterial. Arq Bras Cardiol. 2007;89:e24-79. 32. Rocha Jr. MA. Compliance – você acha que a receita vai ser seguida?. In: Zanini AC, Paulo LG. Compliance: sobre o encontro paciente-médico. São Paulo: Ipex. 1997;4:51-66. 16. Cramer J. A systematic review of adherence with medications for diabetes. Diabetes Care 2004;27:1218-24. 33. Iskedjian M, Einarson TR, Mackeigan LD, Shear N, Addis A, Mittmann N et al. Relationship between daily dose frequency and adherence to antihypertensive pharmacotherapy: evidence from a meta-analysis. Clin Ther. 2002,24:302-16. 17. Rasmussen JN, Chong A, Alter DA. Relationship between adherence to evidence-based pharmacotherapy and long-term mortality after acute myocardial infarction. JAMA 2007;297:177-86. 34. Chan YM, Molassiotis A. The relationship between knowledge and compliance among Chinese with non-insulin dependent diabetes mellitus in Hong Kong. J Adv Nurs. 1999; 30:431-38. 18. Zimmet P, Alberti G, Shaw J. 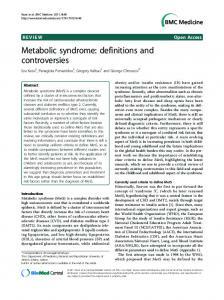 A new IDF worldwide definition of the metabolic syndrome: the rationale and the results. Diabetes Voice 2005;50:31-3. 35. Golin CE, Dimatteo MR, Gelber GL. The role of patient participation in the doctor visit. Implications for adherence to diabetes care. Diabetes Care. 1996;9:1153-64. 19. Khan MS, Jafary FH, Jafar TH, Faruqui AM, Rasool SI, Hatcher J et al. Knowledge of modifiable risk factors of heart disease among patients with acute myocardial infarction in Karachi, Pakistan: a cross sectional study. BMC Cardiovasc Disord. 2006;6:18. Published online 2006 April 27. doi: 10.1186/1471-2261-6-18. 36. Fletcher B, Berra K, Ades P, Braun LT, Burke LE, Durstine JL et al. Managing abnormal blood lipids: a collaborative approach. Circulation. 2005;112:3184-209. 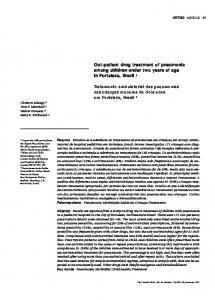 Report "MEtAboLIC SyNdroME pAtIENt CoMpLIANCE wIth drug trEAtMENt"